There’s good news and bad news. The good news is that I have found a mentor to help me get my pattern design business off the ground. She has given me a lot of ideas and information about how to do this and I am well on my way to getting my creations designed and ready for prime time. The bad news is that in order to do focus on pattern design, I will be taking a brief vacation from my blog. I won’t be doing a lot of posts for the next 1 -2 months or so, but I will be posting photos here and there of what I am doing so you know that I am working hard. 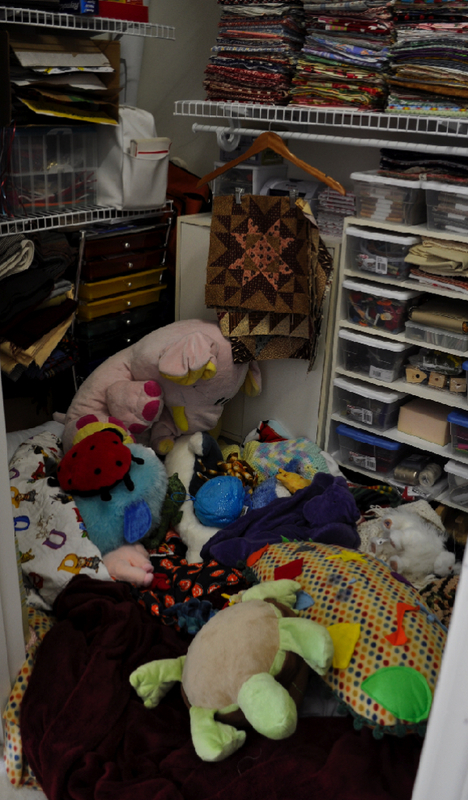 My son recently built a “bed” for me in my sewing room closet since I spend so much time in there. He got all the blankets out of the linen closet and then added all his stuffed animals (so I have some company) to create this little nest. He likes going in there at the end of the day to take a break and enjoy looking at my fabric (a real chip off the old block 😉 ). I’m excited about this new direction and looking forward to showing off what I’ve accomplished. I will miss your blog. The pictures and projects make me feel even more proud of you than ever but it makes me wonder how you can keep up with everything. I love you closest nest. It seems to me everyone should have one of those.